A 43-year-old woman presented to the emergency department with acute nausea and vomiting. She was admitted by the general surgery team with a suspected obstruction of the small bowel. Examination and imaging revealed an enlarged uterus (18 × 9 × 16 cm) with fibroids. Nine years earlier, she had undergone a uterine myomectomy by means of midline laparotomy, after which postoperative pancreatitis and bleeding had occurred followed by repeat laparotomy. The next morning (midweek), a laparotomy was performed to identify and treat the source of the obstruction. An incision from the base of the sternum to the symphysis pubis was made, followed by dissection of some minor adhesions next to the terminal ileum. No discrete bands were identified that could explain the obstruction. The gynecology service was then consulted to manage the fibroid uterus. Upon arrival, the staff gynecologist was informed by the senior surgery resident that no cause of the obstruction was found. The resident then left the operating room. The gynecology team completed a subtotal hysterectomy, after which the sponge count was incorrect. The abdomen and pelvis were explored, but no sponges were found. A radiograph of the abdomen showed no signs of a retained sponge (Figure 1). The abdomen was closed and the patient transferred to the recovery room. 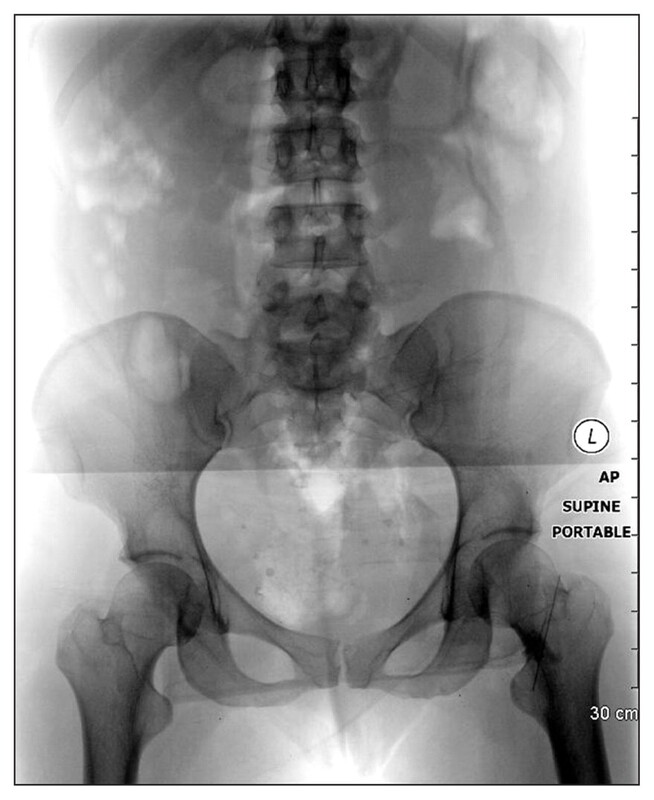 Radiograph obtained after laparotomy for suspected small-bowel obstruction to help locate a retained surgical sponge. Because of the limited imaging area, localization of the sponge was not possible. The circulating nurse remained concerned about the incorrect sponge count and followed up with the gynecologist the next day. The gynecologist requested a computed tomography (CT) scan, and the patient was informed of the incorrect sponge count. At the time, the institution’s policy did not require a routine follow-up CT scan if the count was incorrect. 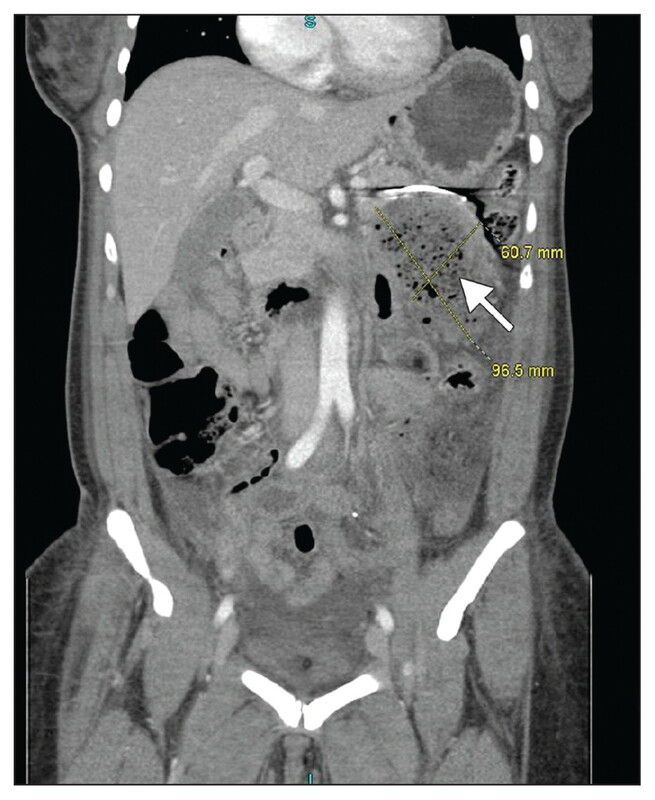 The CT scan showed a radiopaque marker indicating a sponge in the lesser sac below the greater curvature of the stomach (Figure 2). Follow-up investigation with computed tomography. Scan shows radiopaque sponge in the lesser sac below the greater curvature of the stomach (arrow). The gynecology team performed an exploratory laparotomy. A packing sponge was found and removed from the lesser sac. No other concerns or complications arose, and all sponge counts were correct. The patient made an uneventful recovery. Surgical care is complex and is prone to errors and subsequent adverse events.1 The retention of foreign objects such as sponges, needles and instruments after surgery (also known as gossypiboma) is an example of a preventable medical error. The case we have described prompted an analysis of the root cause of the surgical and communication failures that led to this occurrence. When a foreign object is left behind after surgery, a local and systemic inflammatory response may occur. The resulting clinical manifestation can include signs and symptoms of local infection, adhesions, fistulas, obstruction and sepsis.1 A fatality rate of 2% has been reported.2 The most common indication of a retained foreign object is pain, tenderness and infection (in 42% of patients).3 Ultimately, the patient’s risk of complications is increased when there is a retained foreign object. The incidence of retained foreign objects after surgery has varied in the literature. Cima and colleagues undertook a four-year review at a tertiary care centre and reported an incidence of about 1 in 5500 operations.2 After reviewing claims and incident reports of retained objects in 54 surgical patients in four hospitals, Gawande and colleagues reported that the incidence varied from 1 in 18 760 to 1 in 8800 inpatient operations.4 In both studies, sponges were the most common object left behind (in about 68% of patients). Gawande and colleagues identified possible risk factors associated with the retention of foreign objects after surgery.4 These factors included the operation being performed on an emergency basis (risk ratio [RR] 8.8, 95% confidence interval [CI] 2.5–31.9), unexpected change in operation (RR 4.1, 95% CI 1.4–12.4) and body mass index (per 1-unit increment) (RR 1.1, 95% CI 1.0–1.2). Evidence suggests that the most frequent contributor is poor communication.5 Wan and colleagues reported that, in the event of a retained foreign object, team hierarchy and lack of cooperation inhibit the signaling and subsequent reconciliation of the error.3 Some examples of poor communication include disagreements among team members regarding incorrect surgical counts and poor exchange of information during perioperative personnel changes. Unfortunately, these communication problems are not uncommon in the operating room, occurring in about 30% of exchanges between team members.6 Lingard and colleagues found that communication failures were associated with factors such as delayed communication, incomplete and inaccurate content, exclusion of key individuals and issues left unresolved until the point of urgency.6 One-third of the communication failures resulted in immediate effects, including inefficiency, team tension and procedural error. Efforts to improve surgical care include the introduction of the World Health Organization (WHO) Surgical Safety Checklist,7 and local and national policies relating to the provision of surgical care. Although the WHO Surgical Safety Checklist has shown benefits,8 specific policies to prevent the retention of foreign objects are also crucial. Most operating rooms have preventive procedures and policies; however, no standardized practices have been established. Each hospital formulates policies and procedures based on the recommendations of various hospital organizations and professional associations. These include the Operating Room Nurses Association of Canada (www.ornac.ca) and, in the United States, the Association of Perioperative Registered Nurses (www.aorn.org). Both agencies provide guidelines to members on performing surgical counts and protocols to reduce incorrect counts. Policies and protocols for surgical counts are only one part of a prevention strategy. Although they are essential verification methods, they are fallible. In a multivariable analysis, Gawande and colleagues found that failure to perform a sponge count was not a significant risk factor for retention of a foreign object (RR 0.6, 95% CI 0.03–13.9).4 Cima and colleagues reported that, in 62% of patients from whom a sponge or other object was recovered, the instrument count had been correct.2 Additional measures should be considered to ensure patient safety. In the case we have described, multiple risk factors for retention of a foreign object after surgery were present. It was an emergency surgery. When the general surgery team found no obstruction of the small bowel during the initial laparotomy, the gynecology service was urgently called. The unexpected change in operative plans meant that more than one surgical procedure was performed, and more than one team and surgical site were involved. In addition, the sponge was found in the lesser sac, a location not familiar to most gynecologic surgeons; the location suggests that the sponge was likely used by the previous team. The sponge was not detected in the radiograph because the full length of the abdomen (from diaphragm to pubis) was not imaged. Collectively, the key factors in this case — limited communication between the surgical teams, no surgical count when the teams and procedure changed, and incomplete radiographic evaluation — highlight the need for increased communication in the operating room and specific preventive measures during such high-risk surgeries. Increased communication between the surgical teams and more stringent policies in the operating room might have prevented retention of the sponge in our patient. A full description of the procedure by each team and a follow-up by both teams at the time of the final count might have also helped. In addition, having nursing personnel perform a surgical count at the changeover of the surgical teams would have allowed both teams to be present and might have aided in finding the sponge. highlighting the need for consistent guidelines and count policies. To prevent such events from occurring, a critical incident review was undertaken with the perioperative committee to amend the hospital’s policy on surgical counts. A comprehensive radiograph from the pubis to the diaphragm is now required for all abdominal surgeries with an incorrect count. The radiograph must be reviewed by the on-call radiologist to ensure quality and adequate coverage before the patient is transferred from the operating room. If the radiograph is inconclusive, further imaging is strongly encouraged but remains at the discretion of the most responsible surgeon. Any event involving a retained foreign object has strict reporting guidelines. The incident is reviewed by the perioperative committee with all members of the surgical team to identify the root causes and opportunities for improvement. Protocols are a safety net to prevent medical errors such as retained sponges. Although each institution is free to build its own policies, several key tools and procedures may be useful. For instance, the WHO Surgical Safety Checklist encourages open communication among operating room personnel. This team approach helps to ensure that circulating nurses are comfortable following up with the surgeon about incorrect counts and requesting further investigation. The WHO checklist (or a local adaptation) is now provincially mandated in all operating rooms in Ontario, Alberta, Saskatchewan and Manitoba. In Quebec, implementation of the checklist is a requirement for hospital accreditation. Although the checklist may not be formally mandated by other provinces, local, provincial and national initiatives are promoting its use. Health care is an evolving system, with strategies for improving patient safety continually being researched. Safety is always a surgical team’s top priority, and collectively, surgical teams can improve it. Communication between surgical teams is critical during combined operations. Each operating room should have a policy for counting surgical sponges and instruments that is consistent with national recommendations. A count should be considered before a changeover of surgical teams during operations at high risk of errors. A radiograph obtained because of an incorrect count should be reviewed by a radiologist to ensure adequate anatomic coverage. If the radiograph is negative, a follow-up computed tomography scan should be considered. Contributors: Sukhbir Sony Singh was directly involved in the case. Amanda Grant-Orser and Paul Davies were involved in the literature review. All of the authors contributed to the drafting and critical revision of the manuscript and approved the final version of the article submitted for publication.
. Incidence and characteristics of potential and actual retained foreign object events in surgical patients. J Am Coll Surg 2008;207:80–7.
. Improving safety in the operating room: a systemic literature review of retained surgical sponges. Curr Opin Anaesthesiol 2009;22:207–14.
. Risk factors for retained instruments and sponges after surgery. N Engl J Med 2003;348: 229–35.
. Patient safety practices in the operating room; correct-site surgery and nothing left behind. Surg Clin North Am 2005; 85:1307–19.
. Communication failures in the operating room: an observational classification of recurrent types of effects. Qual Saf Health Care 2004;13:330–4. World Alliance for Patient Safety. WHO surgical safety checklist and implementation manual. Geneva: World Health Organization; 2008 [updated 2011]. Available: www.who.int/patientsafety/safesurgery/ss_checklist/en/index.html (accessed 2011 Nov. 6). for the Safe Surgery Saves Lives Study Group. A surgical safety checklist to reduce morbidity and mortality in a global population N Engl J Med 2009; 360:491–9.
. Prevention of retained surgical sponges: a decision-analytic model predicting relative cost-effectiveness. Surgery 2009;145:527–35.
. Bar-coding sponges to improve safety: a randomized controlled trial. Ann Surg 2008;247:612–6.
. Electronic tagging of surgical sponges to prevent their accidental retention. Surgery 2005;137:298–301.
. Initial clinical evaluation of a hand-held device for detecting surgical gauze sponges using radiofrequency identification technology. Arch Surg 2006;141:659–62.
. Cost-effectiveness of routine radiographs after emergent open cavity operations. Surgery 2008;144:317–21.
. A multidisciplinary team approach to retained foreign objects. Jt Comm J Qual Patient Saf 2009;35:123–32.
. The checklist manifesto: how to get things right. New York (NY): Metropolitan Books; 2009. Intravesical gossypiboma: our experience and the need for stringent checklist and training!